Beginning March 24,2018, St. Joseph's will host another Live Christ, Share Christ experience, in both English and Spanish. All parishioners are invited and encouraged to attend. With our Pastor, Fr. Al's complete endorsement, we have embarked on a new evangelization program for the entire parish called "Live Christ, Share Christ". To start up, a bi-lingual retreat was conducted with much success. WHAT IS LIVE CHRIST, SHARE CHRIST ALL ABOUT? The holy Roman Catholic Church has sounded the call to the New Evangelization.1 This is an urgent call of the highest importance, given the dire urgency of the times. A tsunami of evil is overwhelming the whole world. The assault on faith, family and life is in full force. When the Lord Jesus returns, will he find faith on earth? While things seem hopeless, and we seem helpless in stemming the onslaught, there is always hope. Where sin abounds, grace abounds even more. Jesus has already won the victory. As we hurtle to the end of time, we already know how it all ends. In the meantime, the world and the Church suffer. In the meantime, souls will still be lost. We cannot just wait for the return of our victorious Lord, but we must engage, here and now, in the spiritual war that rages. This is the call to the New Evangelization. Throughout salvation history, God has called individuals, peoples and nations. The Almighty God has deemed it right to work with His creatures, to give them the privilege of being agents not only of their own salvation but also that of others. Oftentimes God calls and uses those who are the least and the last, even the lost. This is the mystery of election. God called Israel, the smallest of all nations (Dt 7:7), Jeremiah, who was too young and knew not how to speak (Jer 1:6), Gideon, who was the most insignificant in his family which was the meanest in Manasseh (Jgs 6:15), Saul, who persecuted Christians. In doing so, God manifests that our effectiveness is entirely up to Him. We are mere instruments. We in fact often get in His way. God does His work in spite of us. But this is cause for great joy. We who are nothing can be something in God’s hands. We who are weak can be strong in the power of His Spirit. Our part is to respond to God’s call, and then to give our all. The fruit is up to God. Live Chrst Share Christ is about a lay response to the call to the New Evangelization by both Pope John Paul II and Pope Benedict XVI. It focuses on reaching out to those Catholics whose faith-life has been eroded, to those who have drifted from the Faith and the Church, to those who have succumbed to the culture of a materialistic world. Its focus is on re-evangelizing nominal, cultural or lapsed Catholics. Its goal is to bring Catholics back to Christ and to an active life in the parish. This then is the Live Christ, Share Christ (LCSC) Movement. It is intended for Catholics to meet Christ, to live Christ and to share Christ. It is designed for rapid and massive evangelization, accompanied by the systematic empowerment of laypeople to participate in the work. It is hoped that through this lay movement, the Church will be able to mainstream Catholic lay evangelization, bring as many Catholics as possible to vibrant faith in Jesus Christ, and prepare the bride of Christ for the coming of the Bridegroom. 1 For greater understanding of the universal call to the New Evangelization, read “The New Evangelization—A Work of the Divine Family” by Frank Padilla. Although you will see a video made for the Phillipines it can very well be adapted and applied here at St.Joseph's in Kannapolis, or anywhere else for that matter. THE SECOND LIVE CHRIST SHARE CHRIST RETREAT WAS HELD THE WEEKEND OF MARCH 21&22 . BOTH THE ENLISH AND SPANISH TRACK WERE VERY SUCCESSFUL AND SPIRIT FILLED. THIS IS PART OF OUR PARISH'S ENDEAVOR FOR NEW EVANGELIZATION, FOLLOWING THE CALL OF THE LAST THREE POPES OF THE CATHOLIC CHURCH IN AN EFFORT TO EVANGELIZE THOSE IN THE PEWS , LAPSED AND MARGINALIZED CATHOLICS, AS WELL AS SHARING THE GOOD NEWS WITH THE UNCHURCHED. FOR VIEWING STILL PICTURES ON THE RETREAT GO TO ; " MINISTRIES AND CLICK ON "VIVE A CRISTO COMPARTE A CRISTO. " A large “turn-out” of the Spanish and English Congregations was evident at the recent Live Christ Seminar Retreat. The retreat was given by 12 volunteering Parish speakers, drawn from the Parish; and provided to the Parish itself under the guidance of Pastor Fr Al Riquelme. There were two tracks, one for the Spanish and one for the English speakers and childcare activities for children from 4 to 12 years old. Topics included the “Love of God”, “Love of Neighbor”, and “Fellowship of the Holy Spirit” on Saturday; which all concluded with a Charismatic song and praise and worship on Sunday. This retreat was a Laity response by St Joseph Parish in an effort at implementing the call to NEW EVANGELIZATION as requested by the Catholic Church worldwide. The Retreat goal was Christian evangelization, renewal, and a deeper conversion in Faith in order to develop a more personal relationship with Jesus Christ. The retreat was sponsored by Couples for Christ (CFC-FFL) but not as a hidden or driven agenda yet as a charism gift and it is expected that this might become a Live Christ Share Christ Movement within the Parish to meet the ongoing needs of all the parish. A continuing monthly action meeting will be activated by all/any of the parish Laity ministries (bible study, youth groups, preference for the poor, stewardship, marriage enrichment, prayer groups, etc.) targeting the spiritual growth of the parish or to meet specific spiritual needs and training. God truly blessed our parish with 137 participants, not counting 40 children; who all went home uplifted and spiritually energized. God was also good to us with great weather, fun food, and good community fellowship. 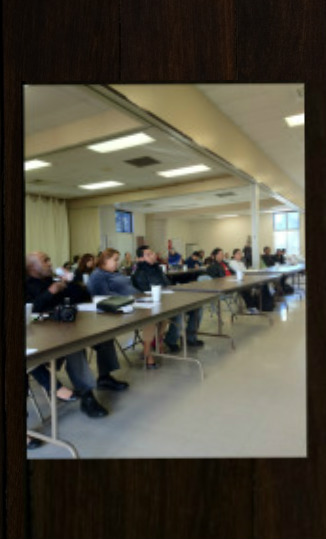 DURING THE SPANISH & ENGLISH TRACKS OF THE “LCS” LENTEN RETREAT ON MARCH 21-22ND; WE LEARNED MORE ABOUT REPENTANCE, PERSONAL CONVERSTION, AND RENEWED FAITH IN GOD.. NOW COME TO THIS MONTHLY ASSEMBLY ON APRIL 25TH AT 10AM SATURDAY TO CONTINUE THE "Live Christ Share Christ" NEW EVANGELIZATION.